For the past year I have been actively hiking the multitude of peaks on Vancouver Island on many on f the different ridges and ranges. Most weekends, I head to the hills with my friends. seeking summits. I’m not only interested peak bagging, I seek new experiences and enjoy the process of hiking; navigation, route finding, hiking, and even editing photographs and writing my blog. 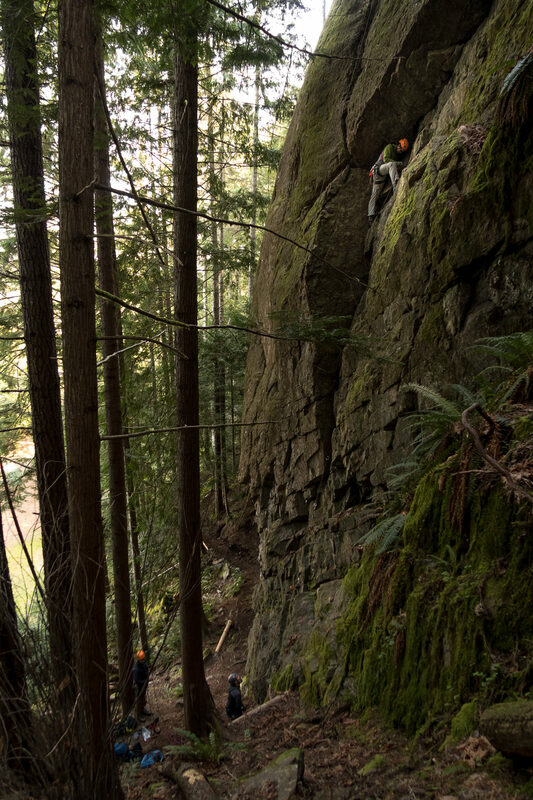 Over the past few months I have hiked in many areas new to me, I’ve checked of dozens of hikes accessible as day hikes from Nanaimo, but I know there are many more. 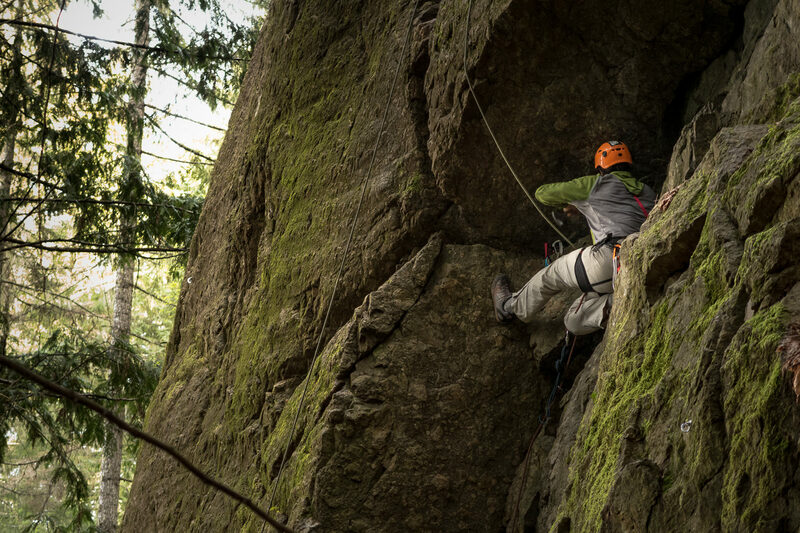 However, I know that there are even more that will turn me back, stop me in my tracks if I don’t bring rock protection and rope with me… and know how to use it. It’s clear that I need to learn to use trad climbing gear, learn to lead climb and set up protection so I can do more than just follow friends. I’ve done some tricky scrambles and I’ve climbed a little in areas where I relied on friends to set gear for protection. I guess it’s a bit like having someone drag you along with them. It puts me in the position of relying on them totally. I watch, listen and learn, of course, but I can do little in the way of contributing to the decisions making process.. Worse, I have no way to determine if they are using correct technique; are they setting it well, do they have the right techniques? How would I know? April 18th & 19th, I took my first steps in learning the basics, I took a class. I signed up to learn some fundamentals of placing rock protection, building anchors and learning to lead climb. Together three of us signed up for Island Alpine Guide‘s Learn to Lead course. Jan, the owner operator of the company, was our instructor. I’ve heard good things about IAG’s courses, I’m happy to report those things are all true. 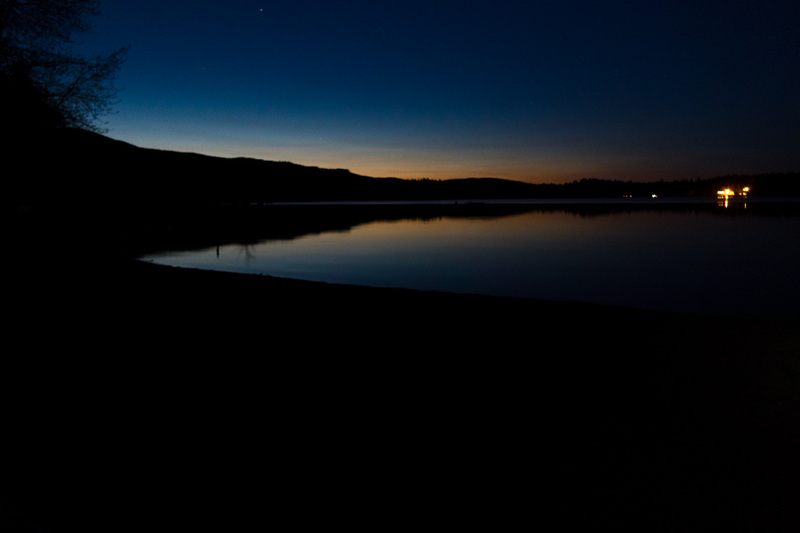 My friends and I planned to camp out at Comox Lake Campground, just outside Cumberland. We drove up Friday night after work and discovered the campground closed! A caretaker, just finishing up work for the day, told us that the campground was under new management and would be repopening soon…. not soon enough to help us for the night. We head back into town and drowned our sorrows in beer from the Cumberland Brewing Company and Pizza from Rider Pizza. Some of you may know about Cumberland, a community in the forest. The bing draw to the area is the numerous mountain biking trails. Rethink it for cycling and starting planning your trip there for a pizza and beer run. Seriously, do yourself the favour! Saturday, we ate breakfast in the sun , at the edge of the Lake. We were already in the parking lot with all of our gear out and organized, by the time Jan arrived for our 9 am course. Right from the first interaction I could tell that I was going to love the next two days. Jan is personable, thorough and willing to work with the students on the skills they need most. He started with a pre-assessment of our individual goals. 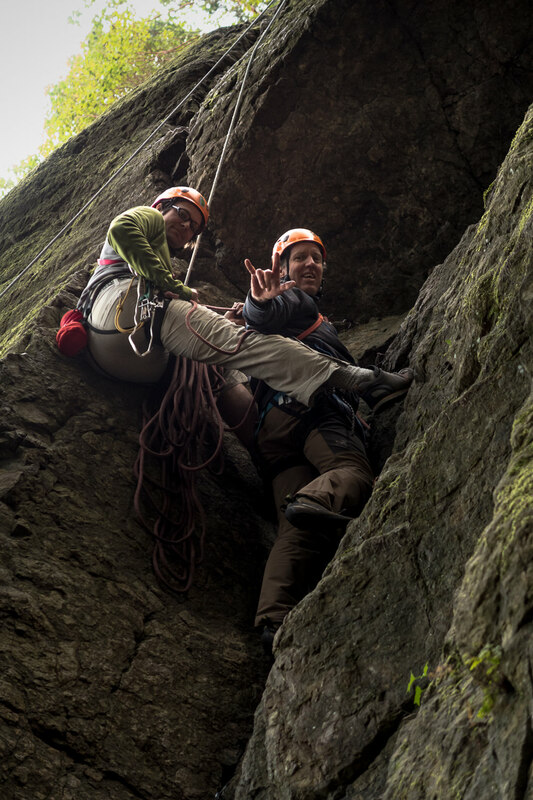 With our small group, we each shared the same goals, therefore Jan was was able to keep the course very specific and even expand the teaching in some areas to address elements of the type of climbing we wish to do. The course flowed very smooth. We covered knots, though we each had done knot practice individually and as a group the night before. What I would say about my personal practice, when it came time to tie my knots on the wall, I needed more practice. There are many knots I can tie with my eyes closed but others I seem to mess up. Fortunately, I can tell when I get the wrong knot, getting the right not is more of an issue. As recommendation for practice, at least a portion of the practice be done bending over with the rope below your knees. The first half of the first day we covered personal safety, types of rock protection, building criteria for choosing locations and picking gear, types of rock protection, placing gear and building anchors. The second half of the day, Chris did his lead climb. Because we are all novice lead climbing, Jan set up a top rope. This extra security gave us insurance against failing to set gears and anchors correctly; simply a lifesaving back up. Jan left us to plan our gear, selecting the pieces we would need for the type of rock we were climbing. After we selected he looked over our choices and talked through our choices for gear. The three of us selected different gear, not relying entirely on what the previous climber selected. One climber on the wall, one person belaying the lead climber and the third person belaying the top rope. The top rope was kept loose, as it was only insurance if the protection of the lead climber failed. 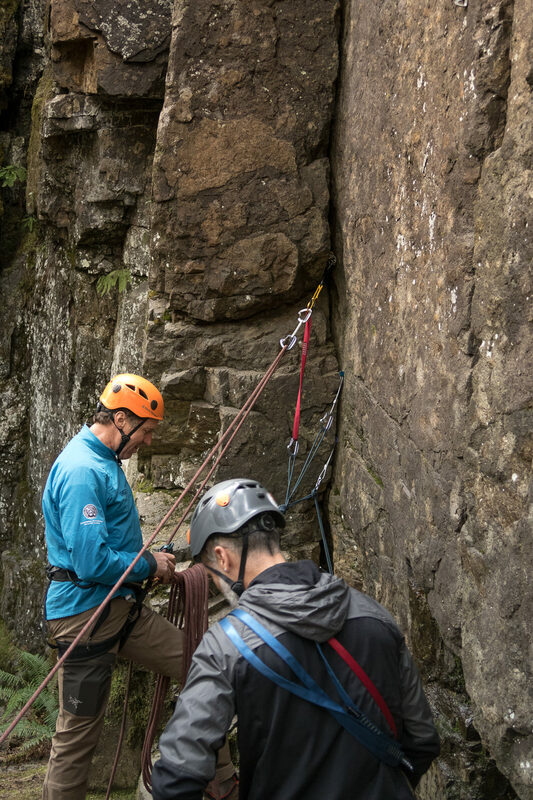 We set our gear and climbed our route and set protection using the principles taught and guided by the criteria we developed. At the top of the climb we set our anchor and tied into the it. The final step, setting up a belay for Jan. He climbed up as we belayed him up. up to inspect our work. 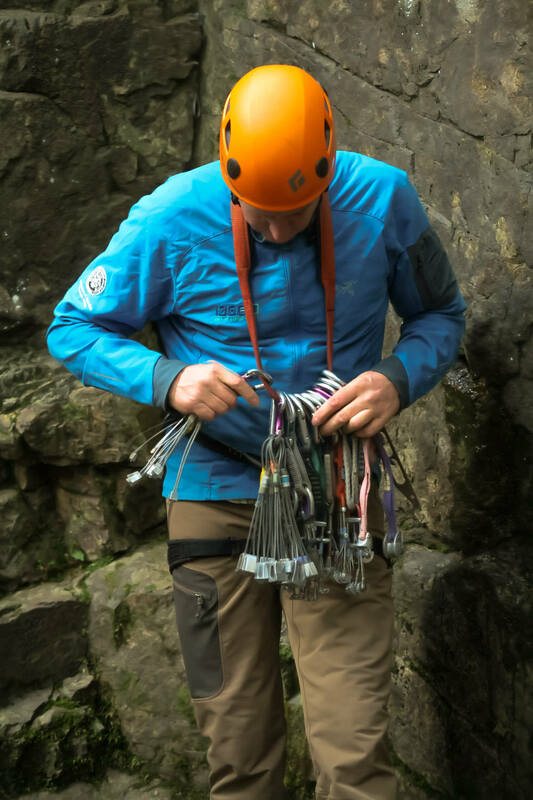 Once at the top he checked protection placement, build of the anchor and the method by which we put our belay together. Day two Patrick and I each did our climb and in the afternoon we took time to practice building our anchors and setting protection at ground level. This afternoon activity was set by us. With the extra time we put together a wish list and Jan helped us with the goals. Perhaps the best part of each day was wrapping up at the CBC. Jan gave us a little extra instruction on knots and answered our various questions about building skills and becoming ACGM certified guides.